1. Hochet disques liés Ateliers Montessori Oxybul, 2. Ensemble de 3 matériels d'emboîtement, 3. Boîte de notion de permanence de l'objet, 4. Banc à marteler Ateliers Montessori Oxybul, 5. Jeu trio de disques à encastrer Ateliers Montessori Oxybul, 6. 3 puzzles botaniques, 7. 3 puzzles d'animaux vertébrés, 8. Coffret Montessori Mes lettres et mes chiffres, 9. Mallette des lettres mobiles,10. Mes chiffres Montessori. I also love this Butterfly mobile with black and white art cards. You know I love Montessori materials - the way they are made, so purposeful and beautiful. While I don't feel it's necessary to have teal interlocking discs I do love some of these French Montessori Materials. I am totally in love with the two sets of puzzles here the botany and vertebrates (they don't ship these international unfortunately - I tried!). Otis has the green Montessori numbers and they are fantastic! I've updated our reading list on my sidebar and I thought it was worth a mention that at this time of year we enjoy this book by National Geographic, it's a lovely book about how Easter is celebrated around the world. Also we know that Fiji has been absolutely devastated by cyclone Winston, if you feel like you can help (I just made a donation!) please check out A Girl and Her World (they do wonderful work supporting girls and their families have access to education). 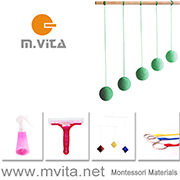 Montessori language materials are presented to the child in a carefully orchestrated sequence. Metal Insets (for hand control), Sandpaper Letters and the Movable Alphabet are all part of this sequence and the process cannot be hurried and stages cannot be skipped. Montessori sees the child as an active learner, a motivated doer and that children have the power to educate and teach themselves. Young children with good phonetic awareness are often ready (and wanting) to make words before their hand is ready for the pencil control required for writing. The Movable Alphabet is for the composition of words, the goal is expression. It is typically introduced once the child knows most of the sandpaper letters, knowing the phonetic sound of the letters, the type, the code, the signs to write. With the Movable Alphabet all of the letters are in front of the child, the child does not need to remember what they all look like or how to form them. Using the Movable Alphabet the child begins to make the connection between the spoken and the written language. This is a powerful connection and it's important the child makes these discoveries for themselves, that the learning is spontaneous. The child will form words and will later be able to read them back to themselves. I will never forget when Otis read his first word, pulling his phonetic awareness together. It is a magical moment. "The word which is pronounced presents to the child a problem which he must solve, and he will do so by remembering the signs, selecting them from among others, and arranging them in the proper order. He will have the proof of the exact solution of his problem when he rereads the word–this word which he has composed, and which represents for all those who know how to read it, an idea." "When the child hears others read the word he has composed, he wears an expression of satisfaction and pride, and is possessed by a species of joyous wonder. He is impressed by this correspondence, carried on between himself and others by means of symbols. The written language represents for him the highest attainment reached by his own intelligence, and is at the same time, the reward of a great achievement." Maria Montessori in The Montessori Method. The child continues this work of the Movable Alphabet to form sentences for the first time. Perhaps later the child will form short stories. As parents we are the first and most important teachers of our children. We use a Movable Alphabet at home. Children spend more time at home than they do at school and should have the opportunity to play and express themselves. 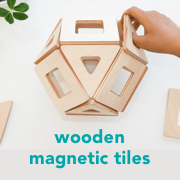 While we don't have a lot of Montessori materials at home this one is well worth it. (We use this Movable Alphabet in print which is affordable for home use and contains a lesson plan which is perfect for parents). At home Otis likes to practice words he already knows and most often composes the names of our family members, he is slowly getting more adventurous with the words he forms and he has started to write short sentences, he uses the Movable Alphabet almost daily and really is in the sensitive period for language. For further information on learning to read and write the Montessori way I use and recommend Montessori Read and Write. Four of My Favourite - Matching and Sorting Activities for Toddlers (using household items). These are four of my favourite matching and sorting activities for toddlers! They don't need a lot of preparation and can be done alongside an adult - matching socks while the adult is doing laundry or sorting cutlery while the adult is doing the dishes. Sock Matching. This could also be done with mittens, gloves or shoes. Perhaps the child can match socks while the adult is folding laundry or tidy the mud room or shoe area. Sorting Cutlery. The child can help to wipe or put away the knives, forks and spoons (children's utensil set pictured here). Matching Lids and Containers. Young children often love to play with containers and lids, why not give them a set that matches and see if they can put the right lid on the right container. Sorting Buttons. We are using crafting buttons (they are good to use as they can be sorted by colour) but many homes have a few buttons that could be used and sorted with supervision. Sorting buttons would be a good activity for the toddler to do at any time but particularly while the adult is sewing or crafting. These are absolutely no pressure activities that might appeal to the child's sense of order! 7. starshapedpress, 8. BesidesYarn and 9. NaturedNature. I love making my own Montessori prints (this is the last one I made). I'm always reading books and making note of interesting quotes. Etsy is a good source of Montessori prints too and these are a few that I love! Using a potty isn't necessarily a part of the Montessori approach to toilet learning. It may work to make the toilet more accessible by using steps or other adaptions. If you are interested in toilet learning the Montessori way I recommend Toilet Awareness and Toilet Leaning - The Montessori Approach. I also recommend articles at Aid to Life and Michael Olaf. There is so much focus in Montessori on fine motor skills I think at times we as parents overlook the importance of gross motor skills, the development and coordination of those large, gross motor muscles and movements. In the classroom gross motor movements would include movement around the room (moving tables and chairs, walking), lifting and pouring, practical life activities like window washing or table scrubbing, walking the line. Otis' class has a lovely playground but also free play equipment such as climbing frames and balancing boards. Maria Montessori knew how integral movement is to intellectual development. "Mental development must be connected with movement and be dependent on it. ""Movement helps the development of the mind, and this finds renewed expression in further movement and activity." In writing about this connection she believed children didn't need specific games or gymnastics just to keep fit, just for health, we don't need to separate movement and thought. Children need freedom of movement too. I can see that sometimes my children just need to get outside and exert their energy, to run until they can't run any more. To laugh and to chase each other. To be free and just let it all out. To me this free time, this physical exertion is just as important as good nutrition, as important as a good dinner or a good book. Running, skipping, swimming, riding a bike or climbing a tree - using all those gross motor skills are just as important as taking a tray off the shelves and working at a desk. Life skills, risk taking, fun, physical exertion, problem solving, critical thinking can all come from gross motor play. Gross motor work also lays the foundation for the use of fine motor skills. My children are not participating in any organised sport this term however the boys are really enjoying and focusing on their soccer and swimming skills. Above the boys are using the Two Mini Soccer Goal Set, they love playing soccer together and it's awesome to use outside or inside on a cold or rainy day and for targeted goal practice (c/o Child.com.au). Montessori Today is written by Paula Polk Lillard who also the co-author of Montessori From The Start. Paula Polk Lillard has many years of experience in Montessori and is the Co-Founder of Forest Buff School. Although the book covers the child from birth the focus is on elementary aged children and is suitable for parents and teachers. It is suitable for new parents and with those with little or no prior knowledge of Montessori. I really enjoyed the tone of the book. It is really easy to read and it's just full of information. I would recommend this book to parents who are considering a Montessori education for their children. To see what is ahead of them, to see what Montessori looks like throughout the child's life. As the author writes the education of the child should be viewed in its entirely, as a whole, "Goals and methods at each age level must fit together to form a cohesive whole, from birth to adulthood". The book includes some Montessori theory and history. It provides a really in-depth explanation and examples of what happens in a Montessori school. It is one of the most thorough books I've read on the second plane of development and elementary (we call this primary) classrooms. This is great news for parents of children 6-12 years. There are very few Montessori books that focus on this age group. The chapters are listed below. I absolutely recommend this book to parents interested in (or already have a child in) Montessori education. This should be compulsory reading for parents of children in the second plane of development (6-12 years). If you have ever wondered what happens in a Montessori classroom or how the Montessori child learns - this book is for you. This is a great read that I know I will go back to over the years. I also recommend getting a physical copy (if you are like me) as highlighting and sticky notes are required. 1. Leaf Polishing at Healthy Beginnings Montessori, 2. Care of a Plant at At Home With Montessori, 3. Cleaning Leaves at Montessori en Casa, 4. Practical Life at Two at How we Montessori, 5. Watering a Plant at Awake Parent, 6. Watering Plants Activity at Montessori Services, 7. Taking care of classroom plants at To the Lesson, 8. Care of Plant Work at Mission Montessori and 9. Care of Plant Work (love this basket and set of materials) via Filev Yuriy (3-6 Montessori). Looking after indoor plants is a great way to introduce care of the environment activities to small children and toddlers. If you have indoor plants this is fantastic to do at home. If you don't have any indoor plants perhaps it's time to pick up one or two for your child/ren to care for and observe? Indoor plants can be observed but also need watering, access to sunlight, often they need repotting, dusting, fertilising and care! I love to have a variety of indoor plants however even one indoor plant at the child's height can be of benefit. A small watering can that the child can hold and walk with is useful. For a very young child a small pitcher near the plant might be easier. A cloth or sponge nearby might be needed for cleaning (or mopping up) small spills. A small spray bottle can be provided for misting plants (especially if in a terrarium) or for spraying leaves for dusting. Dusting or leaf polishing can be done with a soft brush, sponge, cloth, cotton wool or even with a purpose made wool duster. In one of the examples above a small glass bowl of water is provided for the child to moisten the cotton wool before dusting. Perhaps some small scissors can be provided if the plants have old leaves that need to be removed. Giving the child responsibility for a plant is worth considering. An adult can supervise and help the child if the plant is being overwatered, not watered enough or if it needs to be moved for more sunlight. An older child can make observations across seasons and be involved in planting, repotting or potentially propagating. I love visiting the plant nursery and this is a really fun place to take children - perhaps they can pick out a plant of their own! I recently found this really fun idea. I was looking around for Montessori, nature, sensory, play inspiration. What I love about this idea is that the child is working in a natural setting and using real items. It challenges the child to look closely at their natural environment, using all of their senses. This idea is something that will work in almost any natural setting, today we used it in our yard but would work just as well on a nature walk, in the woods, at the beach or park. This idea comes from The Sensory Trust which is fantastic resource in the UK. It is called Go Find It and it is a card game/scavenger hunt. So there are a few ways to play. Essentially the child takes a card and finds an item in nature that matches the card. The child finds something green, rough, orange, small and so on. There are 33 cards so the children are not going to get board, they are being active, using their senses and in some cases using their imagination. This can be played as game where a number of cards can be dealt out to each child and then the children have to find those items. Or the children can be shown one card and they all need to find one item from nature that matches. I love that this is a scavenger hunt that we can take anywhere and use in any season. It makes the children think about the qualities of the natural items and to touch, feel, smell, listen. Rather than find a leaf it's find something green or red or with crunch. I'm a little in love, this is a really beautiful activity and the concept is just fantastic! You can find the Go Find It game in the UK here and the US here. When I received my order The Sensory Trust surprised me with an extra set of Go Find It. I would love to give this set away to a reader! Go Find It is recommended for children 3yrs+ and both my children at four and eight years old enjoy and really get into it! If you would like to enter to receive this set please leave a comment below. I will select one reader after comments close on Thursday 18th February 2016 at 8pm Australian Eastern Standard Time. What is your child's learning style? Visual/Auditory/Tactile/Kinesthetic? At a parent education session at the boys' (Montessori) school one of the teachers spoke at length how important it is to identify each child's preferred learning style. They spoke about how they identify this and how they adapt their teaching so that the information is presented in an optimal fashion and that the learning environment is also optimal for each child. Wow! For each child! Montessori (and many other) schools and environments are designed for not one specific learning type, with no bias but for all learning types, for all children - with the expectation that all children are different and have different needs. I also really love that the teacher spoke about being able to introduce a topic to a child in one style then use other styles to reinforce that learning. Especially when introducing a topic that is very difficult, it is best presented in the child's preferred style of learning. It sets the child up for success and works to their strengths. What are the main types of learning styles? Here are a few remembering that many children (and adults) use a combination of styles. Learns through seeing and observing, needs visual cues. Preference for pictures, images and spatial understanding. Learns through demonstrations and descriptions, enjoy diagrams, pictures, charts and maps. Older visual learners may find written instructions useful. Have a need to see the information in addition to any verbal instruction. May find too much movement in the classroom distracting. Learns through hearing, good at absorbing the spoken language. Preference for sound and music. Learns through listening, discussions and talking things through and even self talk. Enjoys audio books and possibly making recordings and playing them back. Verbal information may be beneficial in addition to written information. May find too much noise distracting (need quiet learning space). Learns through touch and using their hands. Must touch and may find it hard to wait before physically exploring a material. Preference for tactile experiences. May prefer making with their hands and drawing including doodling while learning. Learns through moving and doing. Preference for movement of the body. May not be able to sit still for long periods of time. Hands on learning where movement is encouraged works best. Enjoys moving while learning. Child needs to physically and actively explore areas of interest. Preference for logic, reasoning and systems. Preference for learning and working in groups or with other people. Preference for working in solitude, alone and use self-study. I know that my children are a combination of social and solitary learners depending on how they are feeling and what they are working on. Otis is a kinesthetic learner but I really feel this has more to do with his stage in development. Caspar is absolutely a logic (mathematical) learner. Can you identify your child's learning style? Three tips to Montessorify your playroom. I hope the pictures can do most of the talking in this post. You know there is no such thing as a Montessori playroom, it doesn't exist. For Montessori in the home there is no rule book, there is no manual. We are all doing it our own way in our own style. This is reassuring. There is no right or wrong way. There are Montessori principles we can use in our playrooms though and we can allow Montessori to guide and inspire us! In our home the playroom or work area is used very frequently, Otis is very busy in this area, doing lots of work. The work is varied, often it's large, often it has many pieces. Easy right? Shelves keep the work accessible to the child, the child can see all of their work. It is all within easy reach. It is organised. The child knows where they can find their work and know where to put it back. They can keep their shelves organised and tidy. The child can feel reassured by knowing where all of their work is. It appeals to their sense or order. Having a designated place for each piece of work establishes an expectation for the work to be returned after being used. If the child is unsure of where to put the materials they are less likely to pack it away when finished. Baskets are trays are essential even for non Montessori work. They keep all the pieces of the work together. They allow the child to carry their work easily and independently even as a toddler. They make pack up really easy. I also use baskets and trays to add to the aesthetics of a space. Beautiful baskets and natural trays can add beauty to a playroom. A work mat allows the child to define their work area. It allows them to spread out their work without taking up the entire room. It gives them a boundary to walk around, to work within. It provides a soft and clean work surface. Being able to pack the work mat away allows the space to be used for other activities and also allows the child to keep the area organised. And rolling up the work mat is fun! In the middle picture Otis is using the Real World Geometric Shapes c/o child.com.au (also available in the US here). We use these wooden geometric solids. Otis' work mat is by Daiso. If you are new to Montessori in the home I hope you find these examples useful! When Otis was younger he collected sticks and stones. We had a pile of sticks just inside our front door where Otis would meticulously place each new find. When he would find something extra special perhaps a pinecone or seedpod he would carefully put them in a nature basket. Nature baskets some times over-flow. Some times we have specimens we want to set up in a display, a nature discovery area, a nature table! My boys love the beach and our nature table is now consumed with items from the ocean. A large conch shell, some star fish and a variety of other interesting finds (I would love to find some coral to add to our collection). A Montessori nature table is different from something like a Waldorf nature table. Both would include items from nature. A Waldorf nature table might contain seasonal coloured play silks, wooden carved creatures from nature and possibly a seasonal story book. A Montessori nature table is a little more scientific, likely to include items from nature, a magnifying glass, a field guide or non-fiction explanatory book. It really is a little zoology or biology nook! A nature table (or nature tray/basket) allows and encourages us to bring nature inside. To take some time to explore nature slowly and in detail. And nature tables are always so beautiful! Over time we have collected a good, solid range of educational books. We can always find a book in our existing home library that suits our nature table. We mainly use field guides (flora and fauna), Nature Anatomy and First Discovery Books. I find the First Discovery Books have the perfect amount of information for four year olds. We always have a hand held magnifying glass available. Our Bug Viewer is almost always at our nature table too, it's large and really easy for Otis to use. Because both children use this table I've recently added some labels so they (and I) can identify the shells and use the correct language. And one of the things I love most about this nature table is the really beautiful Discovery Windows. They are even nicer sitting on the window ledge with light streaming through them. They allow us to create a really beautiful and unique display. Our Bug Viewer and Discovery Windows are c/o child.com.au. Everyday our nature table looks different. Our nature table is to be used not just looked at. The specimens are to be held and to be explored. To be poked and prodded. To be touched and felt. To be held to the ear and listened to. To be used as a way for the child to connect with nature. Below Otis is exploring the shapes and designs the shells and star fish make in a sand tray. In our home playing at the nature table is encouraged (always supervise younger children). Our Discovery Windows and Bug Viewer (5x magnification) are c/o child.com.au (however they are available in the US here and similar here). Some paper and pencils would be a nice addition to a nature table. Perhaps some photographs of natural environments too!